Tonight, I was involved with an interesting twitter exchange that got me thinking about the right’s attitudes towards art, literature and culture. Yes. Yes. I know the argument. I’ve heard it before. However, laws do not legislate morality, they legislate actions, which some equate with morality. But, they are not the same. Cussing in front of a lady could land a man in jail at one time. Did not cussing in front of ladies change a man’s idea of the right or wrong of cussing? Of course not. It just punished the behavior. That same man could cuss up a storm when ladies weren’t present. Last year, when I was at the National Diaper Bank Conference in Philadelphia, the keynote speaker talked about influencing moms in regards to caring for their children. She sited statistics that showed fictional television programs did more to change what people do than fact based PSAs. Mom’s emulated their favorite characters on the shows. Messaging in shows is now a common practice. Watch any television show and you’ll see messaging designed to change your thinking on certain subjects as well as your actions. Now when that is coming from an ultra liberal, that is a scary thing. The left has been using literature and art for a long time in order to change the direction of society. They have been putting in messaging to change the way you think and act. And it happens without you realizing it. Feed yourself a steady diet of liberal leaning literature and you’ll soon find yourself agreeing with liberal ideals, whether you want to or not. Why do you think the shift to supporting gay marriage happened so danged quickly? It was because literature and art were feeding this opinion into the minds of Americans. Yes, it does sound very much like a conspiracy theory, but it’s not. It’s backed up by years of scientific and advertising research designed original to get consumers to buy certain products. Contrast today’s liberal leaning, hate everything traditional, literature and art with classic shows from years ago. Lately, I’ve been watching episodes of Zorro with Guy Williams. I had watched reruns of the show as a child and fell in love with the characters. I decided to look it up online and found some of the episodes on Youtube. Boy was I shocked. There is a sense of class in the old show that has been long gone in modern TV. And as anyone who follows me on Twitter will know that I was impressed that there was a great respect for religion. The newer versions of the legend either eliminate religion completely or use it for comedic purposes with little respect shown. As a child watching the old shows, Zorro, The Lone Ranger, Rocky & Bullwinkle, I wanted to emulate these types of characters. I wanted to be on the side of good and fight for what’s right. If we want to return to a society of traditional values and morals, we need to focus on art and literature. We need to bring back the class and the morals that used to be integral in our society. We need to feed the minds with good solid stories, art, television and movies. If you’re not into the arts, you can still do your part by supporting the advancement of conservative literature and art. Money gets those works out into the world where they can be influential. Heck, just talking about conservative authors and their works would do wonders to help build a solid foundation in which to rebuild the culture from the ground up. I’m not talking conservative message fiction. I’m talking good stories grounded in conservative values. You don’t need to shove values down people’s throats to pass them on. Just create good stories that people want to read with good characters people want to read about and emulate. 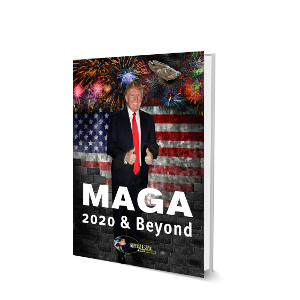 If you need somewhere to start, check out MAGA 2020 & Beyond.